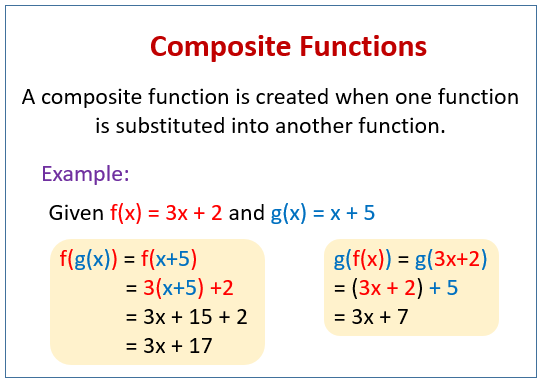 In this lesson, we will look at the composition of functions or composite functions. A composite function is a function that depends on another function. A composite function is created when one function is substituted into another function. For example, f(g(x)) is the composite function that is formed when g(x) is substituted for x in f(x). f(g(x)) is read as “f of g of x”. In the composition (f ο g)(x), the domain of f becomes g(x). The following diagram shows some examples of composite functions. Scroll down the page for more examples and solutions. 2. A newspaper company creates routes with 50 subscribers(n) for each delivery person(d). There is a supervisor (s) for every 10 delivery persons. (a) Write d as a function of n.
(b) Write s as a function of d.
(c) Substitute to write s as a function of n.
How to determine the value of a composite function and how to determine a composite function given two functions? 1. Given the functions, determine the value of each composite function. 2. Given the functions, determine the value of each composite function. How to find the Composition of Functions? What is the composition of two functions?